Very often, when exploring one of these plans that was never built (like the Ringways or the LIM or even the Underways), we just look at all those wiggly lines and get excited about where all the roads were meant to go. In the case of Glasgow, to do that would be to ignore the key thing that makes it so interesting. Unlike most of the rather fantastic proposals elsewhere, Glasgow's plan was just that: one single plan. It covered every aspect of the building of major new roads, from timing and land use to detailed design and predicted traffic flows. One document did it all. The roads themselves are explored elsewhere, but this section looks at the plan for what it is: one astoundingly comprehensive document that serves as an instruction manual for the rebuilding of a whole city. It started while the consultants were preparing A Highway Plan for Glasgow. In line with their brief, they were devising a system of new high-capacity roads within the boundaries of the City of Glasgow. Towards the edges the roads went back to their old courses and passed to another authority. In some cases the plans aligned nicely, such as the Ayr Motorway (now M77) which was matched up with similar plans in Renfreshire by mutual consent. They were contacted by the Burgh of Rutherglen, a separate authority looking after a smaller town south-east of Glasgow but which was already blending in with the city's urban outline. Rutherglen commissioned the same consultants to advise them on their traffic problems. The response was to connect the two reports to bypass Rutherglen without concern for avoiding the Glasgow city boundary, to the benefit of both. They noted that "further modifications or additions of this type may be required as other commercial centres consider their future development...". That's exactly what many of them did - Renfrew, Paisley, Motherwell, even towns as far afield as the newly developed Cumbernauld. As each town joined in the scope of the plan grew and the result, two years later, was the publication of a second, much more weighty report. It was called the Greater Glasgow Transportation Plan. Its recommendations kept Glasgow's core highway network from its predecessor but extended the motorways and expressways outwards, turning what had been spurs into full ring roads and tying together the future plans of places as disparate as Cumbernauld and Paisley. The level of detail in which the plan suggested redeveloping the city (and eventually the whole region) is neatly exposed in its smaller-scale recommendations. Once the pattern of major routes had been established through the urban area - the motorways and expressways - the rest of Glasgow's roads were left only to serve local traffic movements. The consultants suggested that it was now possible to modify the existing urban area to suit its new, quieter nature. To begin with, areas in which it would be desirable to create a more peaceful environment (principally residential districts) were designated as 'Environmental Areas'. Within these it was suggested that the street network be adjusted to create a series of cul-de-sacs (if only by blocking existing streets) to remove any through-traffic. This was particularly useful where minor residential streets connected to a through route (such as an expressway), in which case the end of the street could be blocked, providing benefits to the main road too. Example of Environmental Area proposals, with cul-de-sacs reducing the number of accesses to the Great Western Road expressway. Click to enlarge. In the example above, located a little way north-west of the city centre, the existing street network remains but has been restructured, with the Expressway (labelled Great Western Road) taking overall priority, a small number of other routes (with thicker black lines) providing through routes, and almost everything else merely a cul-de-sac branching from a more important road. Compare this to a modern map of the area which shows that, in this small area at least, the plan was mostly carried out. The accesses onto the A82 have mostly been blocked with access provided from the other end of the streets. A Highway Plan for Glasgow actually went further, into the sort of detail that might be termed obsessive. Within the re-planned communities, it was suggested that new district centres might be desirable (bearing more than a passing resemblance to the design philosophy of New Towns like Warrington) and the consultants were kind enough to plan out what one might look like. The one pictured to the right (click for a larger version) was proposed for Shawlands Cross, an area of South Glasgow on the route of the A77 Kilmarnock Road. It proposes, in excruciating detail, how a small shopping centre might be laid out, complete with individual shops and a terraced pedestrian square. Shawlands Arcade does exist, bearing a passing resemblance to these plans, though on a smaller scale and without the hotel. And so from the small scale to the decidedly large. A Highway Plan for Glasgow, of course, was aiming to provide a solution for the entire city in one go. The Greater Glasgow Transportation Plan looked even wider. As a result, the consultants examined the region as a complete entity and based their network of major roads on city-wide needs, rather than providing smaller local bypasses. It was by this sort of logic that the A82 Great Western Road became an expressway, but longer distance traffic that was travelling from one end to the other was actually expected to take the Maryhill Motorway and the North Link Motorway instead, circumnavigating the whole area. Probably the most surprising part for those used to British urban design - and the point that gives away, more than anything else, that the consultants had well-thumbed copies of American design textbooks close at hand - was the provision for long-distance traffic. An initial look at the plan shows a series of ring roads and, in a world where the M25 exists, the first assumption is that the sweeping outer ring road was to allow long-distance traffic to avoid Glasgow. It doesn't seem to be this way. For one, the outer ring (split in two and named the "Paisley-Hamilton Motorway" and "Campsie Expressway", with no reference to orbital traffic) was programmed to open very late in the plan, and long-distance traffic would therefore be getting through Glasgow some other way until then. In actual fact, much of this traffic was expected to take a direct line through the city and use the Inner Ring Road. The design of the Inner Ring was based on a set of predictions about demand for the various possible paths around the city - how many people would enter on one road and reach the city using a particular sliproad, or how many would come in one way and leave by another, and which path they would take around the ring. Their predictions for how this demand would look in 1990 are represented very effectively in a traffic flow diagram (above left, click to enlarge) where the thickness of each line represents the traffic volumes expected to take that particular route. What this diagram makes clear is that a major flow runs from the south-west to the north-east corners - disguised because it appears as two separate lines, one going via the north side of the ring and one via the south. There are similarly chunky lines connecting other radial routes. The layout - and width - of each section of the Inner Ring was then based upon these estimated flows. The result is shown below. One of the most astounding things that the part of the Inner Ring Road we are familiar with - the north and west sides that exist as the M8 - is the quiet side of the ring. The five lanes of the Kingston Bridge were expected to carry 60,000 VPD in each direction, but further north, the two lanes at the north-west corner that currently form a bottleneck were designed for about 19,000 VPD. In contrast the south and east sides of the ring were designed to carry 28,000 VPD at their quietest point. It's no wonder the road we see today struggles to cope with through traffic - more than half of it was meant to take another route that was twice as wide. In order to create a brand new road network across the whole of a city, some economy could be found in creating a set of standard, stock elements that could be repeated and re-used again and again in every situation. 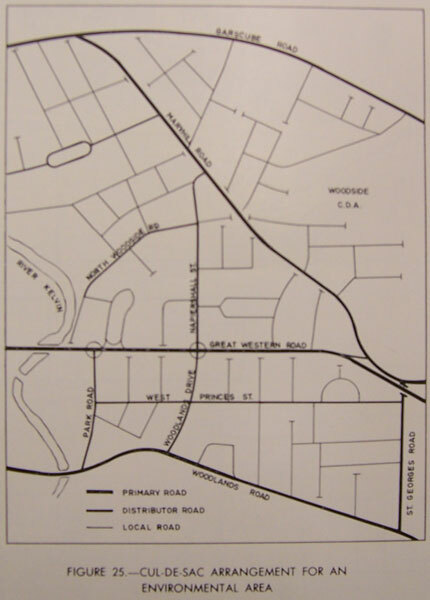 A Highway Plan for Glasgow has pages of standard highway cross-sections for different classes of road, bridge outlines, verge layouts, retaining walls, embankment angles, parapet designs, support columns, guard rails and more. Much of this is the trivial matter of how wide hard shoulders should be, a particular textured pattern on retaining walls, or a nice bulge in the central reservation to direct traffic away from a right turn lane (above). Where it becomes most interesting is where the consultants start betraying their sources by proposing channelised junctions that are highly reminiscent of those found in American highway planning. It was, of course, perfectly logical that the various highway plans should draw on American best practice. There was no better template for an urban highway network. The UK had nothing similar in the mid 1960s - a handful of disconnected urban road schemes, some disastrously obtrusive, that were mostly scattered around London or northern England: roads like the M4 elevated section, the Leeds Inner Ring Road, the East Cross Route. Across the Atlantic there were, by contrast, no shortage of examples of urban roadbuilding on the sort of scale that appealed to Glasgow's leaders. America had established design standards and techniques that were embryonic in the UK. It was really no surprise that the M8 passing through Glasgow is often described as being the closest the UK comes to a Los Angeles freeway. That's exactly what it is. Nothing reveals this better than the example the consultants give of their design process, where they list all the options considered for the design of the interchange between the Stirling Motorway and the North Link Motorway. Suffice to say there wasn't a roundabout in sight. Just like the Inner Ring Road (above), it starts with a diagram of the expected traffic flows through the junction, above right, and then sketches the various ideas, below. The last image in the series is the chosen design. The plan as detailed above is astounding enough as it is. It might not have completely eliminated traffic congestion but it would have had a fairly good go at it. The icing on the cake is that The Greater Glasgow Transportation Plan is just that - a transportation plan, not a highway plan. As well as massive new road projects across the whole of the Glasgow region, it proposed similar expansion of public transport - to the extent of electrifying and four-tracking suburban railway lines, new bus interchange facilities, new bus routes, improved connections between bus and rail, and much more. It even included a few short sections of new railway. This was - let's not forget - a short time after the Beeching Report recommended the closure of most of Britain's rail network. Of course, the public transport ideas were no more realised than the road plans. But imagine if it had been done - Glasgow would now be some sort of transport utopia, with a road and public transport network to rival that of any other world city. On the other hand there wouldn't be much space left anywhere to put things like buildings and people.